You are here: Home » MEDIA » Books » The Joy Of Mathematics by Alfred S. Posamentier (book review). The Joy Of Mathematics by Alfred S. Posamentier (book review). I like covering maths books from time to time and this one is going to be useful for you and your sprogs. You’re not only shown how to do it but the algebraic formulas so you can apply the sums quickly. There’s a lot to digest here but if you learn only a few of them a day, then you’ll carry this book in your bag until you learn more. Just because you think you can do most of them by calculator doesn’t mean you can’t do them by hand. 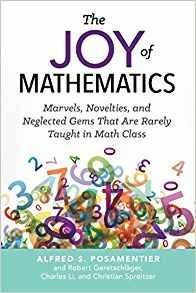 For the record, the sub-title of ‘The Joy Of Mathematics’ is a mouthful at ‘Marvels, Novelties And Neglected Gems That Are Rarely Taught In Math Class’. Seeing the information here, you do have to wonder why they aren’t, especially as this book shows some useful short-cuts without the need of a calculator or computer. I should also point out that author Alfred S. Posamentier is only the first name on the list as there are also Charles Li, Christian Spereitzer and Robert Gertetschläger but this would no doubt overflow the on-line book databases. For the sake of this review, I’ll refer to them all as ‘the authors’ as we’re not taught the division of labour. One of my favourites is working out whether a large number is divisible by 3 and/or 9. The palindromes of numbers while although detailed did make me wonder what happens under base 2 (that’s binary) and other bases and are they as prevalent. The authors explores everything from trigonometry to statistics and anomalies. The one that I still think they got slightly wrong is where having any group of people together, the odds are someone will share the same birthdate as yourself is higher than you’d expect. Mostly because there are clump birthdates. You can match off against holidays or even the change in the season to when you were born and find common denominators for more people to be born within a certain date threshold. A lot of animals, not just humans, are more fertile in the autumn to ensure their offspring are born in the spring. Of course there are bound to be random or significant dates as well creating other clumps that also increase the odds of close birthdays. If you’ve ever wondered at the origins of particular mathematical symbols, the authors explains those as well. I now see the square root symbol in a new light. Saying that, I do have to wonder how the ‘x’ multiplication survives when a central dot can replace it at college level. Why not be consistent from the start? The later chapters focus more on maths and shapes and might suit people who are up to their eyeballs with maths today. I did feel this moved away from some of techniques of the earlier chapters but suspect those who need the info will benefit from them. Oddly, the only thing neglected here is calculus and I’m sure pupils would benefit without such info to digest it better. Although your sprogs might say they can rely on calculators these days, understanding the basics of mathematics so you can do without it is useful and any book that can help in this is useful. I have met people who can’t do simple arithmetic without a calculator. On one hand, they *can* do it with a calculator. On the other, if you don’t understand the basis for calculations, the number the calculator returns might be the correct result of the calculations, but the wrong answer to the question. I totally agree. This book has a lot of maths theory in it as well. I take it your co-worked couldn’t get a solar-powered calculator. I’m pleased the reviewed volume goes into theory. There were more than HP models out back then with some doing the complex stuff but look at how things have progressed in the past 30 years. With my first job, I discovered that the main calculating tool was a slide-rule with only one bench calculator for the entire lab complex but that quickly changed. I had a good HP emulator running on my Palm OS PDA. But the issue is consistent over time. If you don’t understand the principles, you can’t make effective use of the tools. I turned lab computer programmer in the end as well and for that still needed the maths theory and working variables. I think the decision process in commercial programs was never sorted out. I mean why bill someone for a 1p when it would cost more in paper and postage than to ignore until the amount was worthwhile. Programming needs good logical thinking. I don’t necessarily believe that and a simple line of intent or even adding any tiny amount to the next bill, which is done already, isn’t difficult to implement. I can see some businesses saying all those pennies add up but so can all that postage as well. A lot of banks and some utility businesses offer both paper and digital options these days. I prefer a paper trail with some kinds of bills. « Writings In Bronze by Will Murray (book review).